Muju Resort, which is located in its 2,123,000 pyeong area within the Deokyu Mountain National Park and is a representative mountain resort in Korea, is a general resort for four seasons pursuing for the state harmonized with nature & human beings and arts & health on the basis of the basic concept of the harmony between nature and human beings. It boasts of its fantastic scenic beauty enough that you may be illusioned as if you were in an European country when you step into the entrance of the resort, since Muju Resort seated within the gorgeous natural environment of Deokyu Mountain and all the infrastructure, such as each building and street, etc., are harmonized with the mountain terrain in an Austrian style. 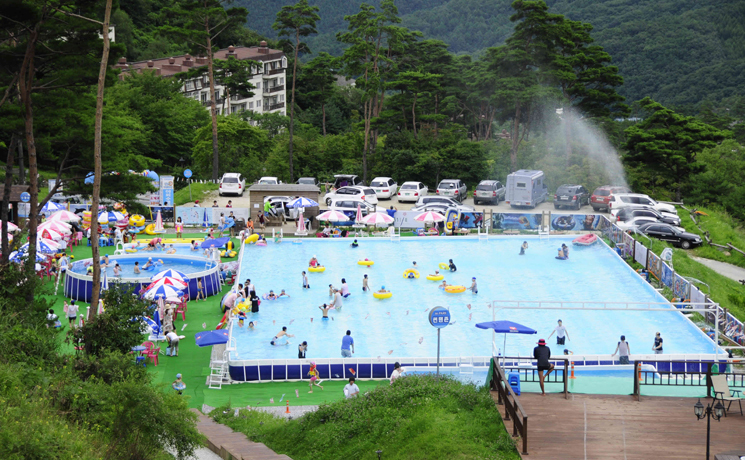 Muju (35kms) ▷ Muju Resort: it takes around 40min. by shuttle bus. Food Stuffs - Spaces for Food Stuffs where you can enjoy any foods according to your tastes! 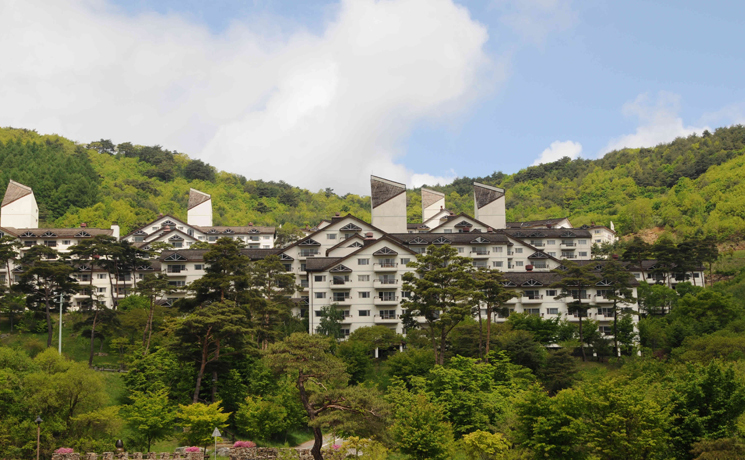 A European-style elegant hotel, 'Tirol', you can see in Korea! Enjoy a Orthodox Supper with various menus at Hotel, 'Tirol', while taking a comfortable rest! Healthy Teas, Fresh Fruits Juice, Coffee, various kinds of beer and cocktails, etc. A coffee shop giving you a pleasure with the tasty and inexpensive coffees! A place where you are caught up with a continuous festival fever! A festival with Various Tastes of Foods on the Carnival Street is waiting for you again! A place where there are some chickens and cool beer. There are some live band performances and the up-to-date singing room facilities. Beverages> Simple Beverages, Cocktails, Draft Beer, Various kinds of Beer from many countries, Wines, Whiskeys and Cognac, etc. (+82) - 063)320-6902 A band from Philippine performs music from 20:00 every day. Do you remember the romantic love between Hae-won and Min-woo? Please share a romantic memory of 'Summer Aroma' along with Coffee Aroma. Halls for groups more than 30 people are well prepared. Gucheondong Sanchae Bibimbap, Native Region Darkdoritang and Dakbaeksuk, etc. 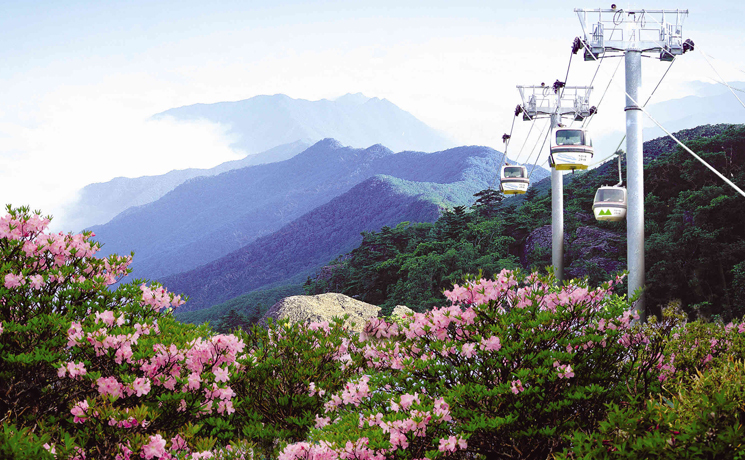 You can taste Haemul-pajeon, Dotorimuk and cool Dongdongju (thick rice wine) at the top of Mt. Deokyu, 1,520 m above sea level. How about energizing your body with sound foods stopping by for a while before going to take a gondola? Cool Beverages and Warm Coffee~, Sausages and Chicken Nuggets are also prepared. First of all, when entering the 1st floor, you can see a moody cocktail bar. You might shake your body automatically listening to pleasant music with high-pitched sounds. Especially, there are many youths visiting to burn out their boiling youth energies and since various genres of music melodies float over, anyone can enjoy dancing without any psychological burden. Place equipped with the well-accompanied and fantastic sound facilities! Those singing rooms have the clean and tidy facilities and the best quality sound facilities and have the recordings of the latest songs as well as moody old songs. So, you will never feel sorry not to sing a song you want to sing. You can enjoy various currently popular PC games, such as Diablo 2, Star Craft, and Linage, etc. and it is available for you to enjoy video chatting on-line. 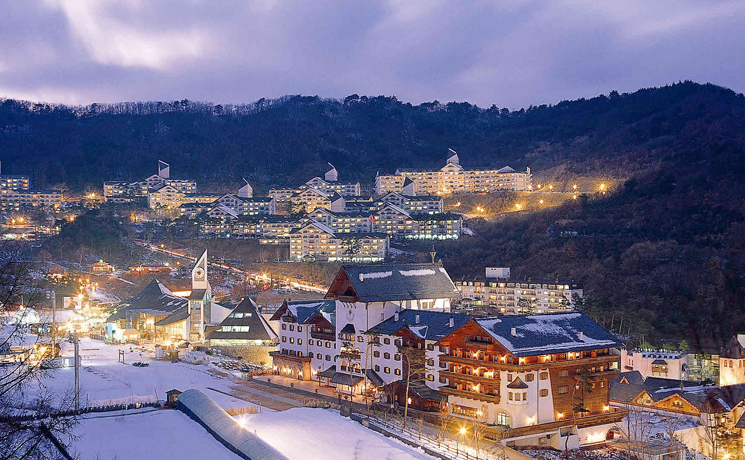 It is a place where you can brag to your friends at home 'without going outside' sending a message saying, "I am enjoying skiing at Muju Resort", via e-mail. The big game arcade, around 140 pyeong, is full of around 79 kinds of game machines and you can enjoy the up-to-date games, such as BPM and PUMP, etc., there. In addition, just next to the arcade, there is a billiard room where you can play three-cushion &pocket billiards and at one side of the arcade, there is also a Beretta Gun shooting range where men and women of all ages can enjoy the games. The Jungle Inn, a place for children's amusement, has various amusement and recreation facilities, so the children tend to lose a track of time while playing there. It is a place for you to play three-cushion &pocket billiards at around 20 billiard tables. And also there are some ping-pong tables at one side in order for you to warm your body up. It might be good for your family to play a game for dinner by dividing into two opposite sides. Enjoy a well-being life through experiencing medicinal herb plants. Feel the emotion of the experiences by five senses at the aromatic herbs experience hall. "From head to foot ~ Another pleasure at Muju Resort"
You can buy all the underwear brands, which Ssangbangwool Co., a synonym for underwear industry, recommends you with confidence, such as Ex-Zone, Suggest and Try Sports, etc., at very low prices. All the brands of Ssangbangwool Textile Co., such as INTERMEZO, LEE, GIVY, KIETH, JAMES KESLER and TINY TOON, etc., are sold at discounted prices more than 40 % of the original prices. It is a fashion specialty store dealing with the brands of world famous designers. Here, you can shop for some famous clothing brands, such as Max Mara, Sport Max, Prada and Tokyo Outlet Brands imported from Japan, etc., at exceptionally low prices compared to the designs of those items. It sells various souvenirs, such as Walt-Disney Character items and Muju Resort Character items, etc., to let you remind of precious memories. Muju Sante & Beauty SPA Salon helps you maintain the best condition and relieve your stress while staying here by providing various health services, such as skin care, sports massage, median massage and aromatic therapies, etc., along with the SPA services. Foot Massage for Health: Aromatic Foot Median Massage, Couple's Feet Health Massage (2 people at a time) and Filial Piety Foot Massage for a Parent (one person at a time), etc. It is a place for you to play three-cushion & pocket billiards at around 20 billiard tables. And also there are some ping-pong tables at one side in order for you to warm your body up. It might be good for your family to play a game for dinner by dividing into two opposite sides. An ambulance car is always ready for 24 hours preparing for any unexpected accidents. ※ The pharmacy is closed in off-season other than in on-season like summer and winter.